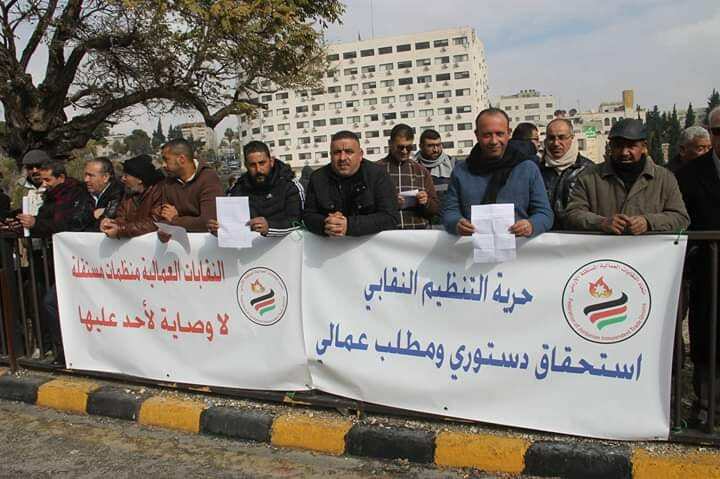 The report recommended the enactment of a law to regulate trade union work in the Kingdom, including workers in the private and public sectors, in accordance with the provisions of the new Jordanian constitution for 2011, and the decision of the Constitutional Court No. 6 of 2003 and based on the texts of international treaties ratified by Jordan, especially the International Covenants on Civil and Political Rights in addition to the Economic, social and cultural rights. The report, issued by the Phenix Center for Economic and Informatics Studies on Sunday, in cooperation with the Friedrich Ebert Foundation, entitled “Freedom of Association in Jordan”, recommended that, at present and in the short term, and since the Labor Law is currently before Parliament, it is required to amend all articles related to Freedom of Association and collective bargaining in the Jordanian Labor Law. The report focused on the importance of amending the definition of collective labor dispute contained in Article 2 of the law so that “any dispute between a group of workers or the union on the one hand and between the employer or the employers’ union on the other hand about the application of a collective labor contract or its interpretation or concerning working conditions”, in order to enable all workers to benefit from labor dispute resolution tools, such as appointing a conciliator, a conciliation council and a labor court, and not limited to workers who included by trade unions. The report also recommended the repeal of Article (98) of the Labor Law, which includes restrictions on the right of workers to form trade unions and the full right of workers to establish their trade unions and amend the Article 100 of the Labor Code, which gives the General Federation of Trade Unions the right to establish a unified system of trade unions and to restore this right to members of the general bodies of trade unions. In addition to amend Article (116) of the Labor Law so that the minister’s authority to dissolve the unions is canceled and referred it to the judicial authority.